For the second time this season they turned on the lights at Michigan Stadium, and for the second time this season nature showed its unabashed disapproval. Unlike last month, though, Michigan avoided throwing caution to the wind and, for the most part, avoided throwing at all. Michigan’s running game put up 371 yards, a performance Michigan fans haven’t seen the likes of since…well, I’d probably have to ask the people I saw in front of the stadium with commemorative Rose Bowl canvas tote bags. The ominous been-here-before feeling that hung over the stadium lasted three plays. 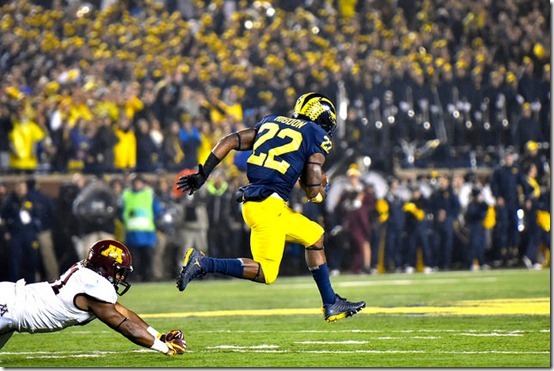 Demry Croft hit slot receiver Phillip Howard for 25 yards on a busted Josh Metellus coverage on 3rd-and-7; they then rushed for no gain and passed for eight before Maurice Hurst tipped a Croft pass and nearly intercepted it himself, forcing Minnesota to punt. Brandon Peters got his first career start for the Wolverines and, on their first play from scrimmage, hit Donovan Peoples-Jones for an easy eight yards. From there Karan Higdon carried for 47, a Khalid Hill dive converted a 3rd-and-1, and Peters hit Sean McKeon on a throwback screen for 20 yards and a touchdown. The drive accounted for 32 of Peters’ 56 passing yards on the night, including his lone touchdown. Michigan was largely able to shelve the passing game before the midpoint of the first quarter. Minnesota responded with a well-executed drive, first hitting Howard—who was again uncovered in the slot—for 16 before calling nine consecutive rushes, including a 10-yard toss to Rodney Smith that Brandon Watson closed hard on but was unable to keep out of the end zone. Two plays later, Karan Higdon needed one cut and a nice seal of the edge from Khalid Hill to go 77 yards for a score. The ominous feeling had lifted, replaced by an offense averaging 18.3 yards per play. By the midpoint in the second quarter, Don Brown had made his adjustments, Khaleke Hudson had already racked up seven tackles, and Chris Evans had started to trade long runs with Higdon. Evans put up back-to-back runs of 18 and 60 yards to put Michigan up 20-7, and Michigan finished the half with 266 yards on the ground; Higdon had 163 on nine carries, while Evans had 111 on six. Michigan came out flat after halftime, going three-and-out on their first two drives of the third quarter. Minnesota took advantage of a short field and a couple of successful runs from their backs to creep into Michigan territory. Croft then dropped back to pass on 2nd-and-10. 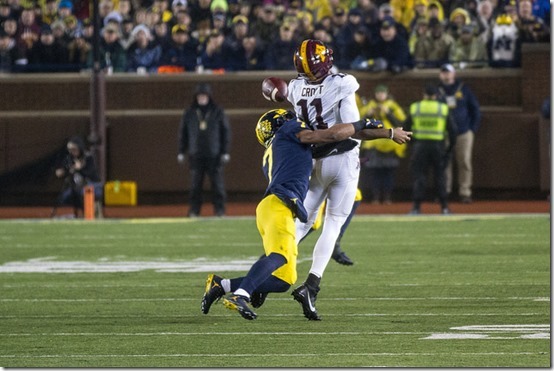 Hudson went over a cut block and lived up to his “Hitman” twitter handle, ripping down Croft’s arm and forcing a fumble that was recovered by Chase Winovich. The backs alternated carries again, Peters never had to look off his first read in Peoples-Jones to get 10 yards on a dig on 3rd-and-6, and Higdon then twisted his way into the end zone from five yards out. Michigan’s score off the turnover put them up 27-7 and essentially ensured that the Little Brown Jug would stay safely in Ann Arbor, spared from having to endure another Stanley Cup-esque tour of the land of 10,000 lakes. The rest of the game played out in uniform fashion for Michigan. Don Brown’s unit was no longer surprised by Minnesota’s sweep action, while the offensive line continued to open holes for the running backs. Cesar Ruiz stepped in for the injured Mike Onwenu and showed that he could pull and target well in the run game in his first career start; he was yanked from the game after a pass-pro mishap resulted in a sack of Brandon Peters. The rest of the line had similar difficulties with Minnesota’s stunts, but they more than made up for it with their ability to gap-block; counters, power, and dives were enough to put Minnesota away. Michigan’s defense, led by Khaleke Hudson’s 6.5 TFLs and 2 sacks, looked like it usually does: excellent 90% of the time, in need of adjustment 5% of the time, and cursed in coverage 5% of the time. The story tonight, though, was Michigan’s offense emphatically demonstrating that they, too, have an identity, a new usual. “Looked up at one point and the statistics looked like we were Air Force. Thought we were Air Force the way we were running the ball,” Harbaugh said. And poor damn Don Brown thought he crossed them off the schedule weeks ago.